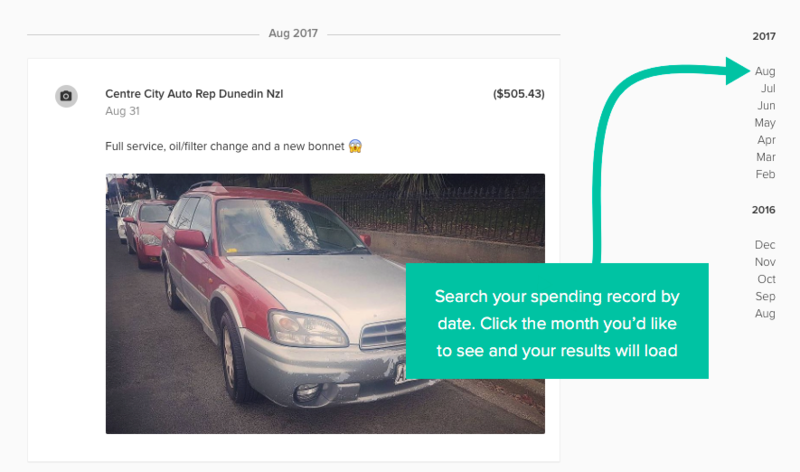 Timeline is a place where you can view memories about your finances - like your favorite purchases! Transactions with added notes, images or attachments will appear on your Timeline. Your transactions are a record of your earning and spending history, and PocketSmith holds all of this information for you! The Timeline feature is like a journal guided by your earning and spending activity, all you need to do is add notes, photos or attachments to the transactions that matter to you and they'll appear on your Timeline. 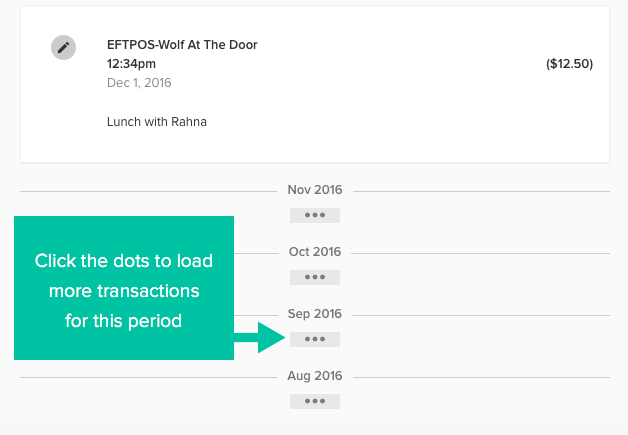 Adding notes to transactions will also make it easy to find them on your Timeline at a later date. Use the Timeline feature to document your favorite purchases - collector items, new shoes, favorite holidays, flights purchased, Airbnb stays, delicious drinks, amazing dishes at restaurants and much more. Timeline can be used for a more functional purpose too - such as documenting visits to the doctor, dentist, childcare costs or car repairs. 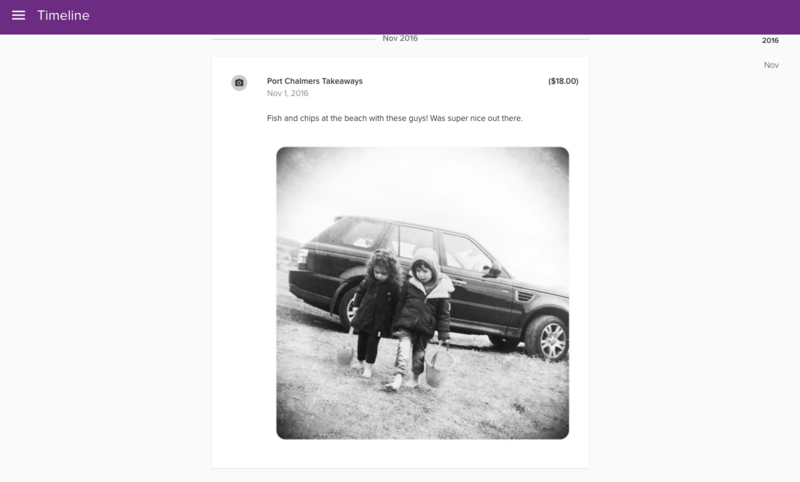 All you need to do is add notes, images or attachments to your transactions on the Transaction page. If you have already spent time doing this, you'll find all of these transactions listed on the Timeline. Load your Timeline ( Accounts > Timeline), and your memory will appear! If you want to find results on your Timeline for something specific, you can use the sidebar options to filter your results. You can also view your memories by time periods. 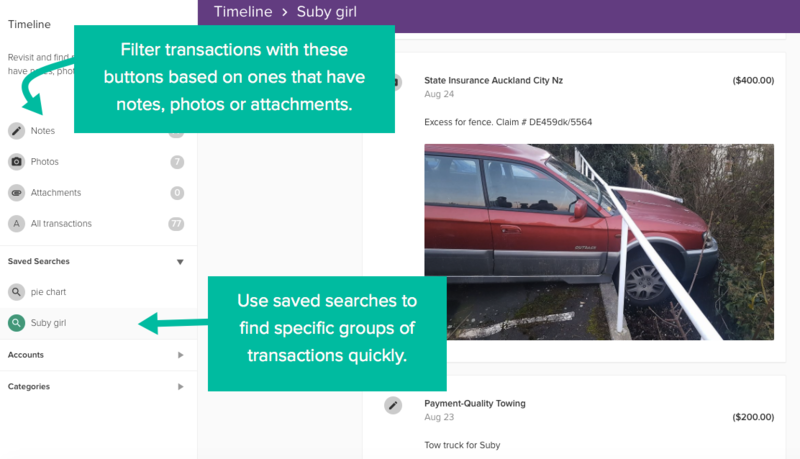 Using our saved search feature is a great way to really refine the types of transactions you want to see. This is useful to track things like when the car was last serviced, what repairs were made, or how much the repairs cost. The right-hand side of your Timeline will show a breakdown of years and months. Click the month you'd like to see your memories for and your results will load. Click on the search icon in the far right of the toolbar to perform a keyword search of your Timeline.